Certainly the most impressive building that I visited on a trip to Rome in the summer of 2012 - this is the famous Pantheon which was built by the Roman Empire about 2,000 years ago. With a diameter of 142ft (43.3M) the dome is still the largest unreinforced (ie no steel reinforcement) concrete dome in the world. 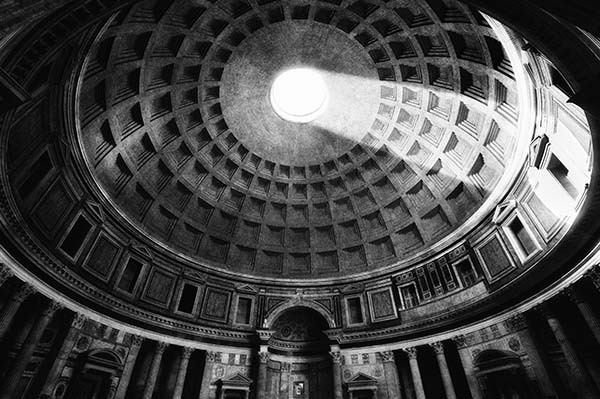 The dome is coffered to keep the weight to a minimum and a special high strength 'pozzolan' cement, invented by the Romans, was used. The additives in pozzolan cement are still being used today for modern structures.